Trind Caring Color Nail Lacquer Summer Shades - with swatches and a special discount offer! 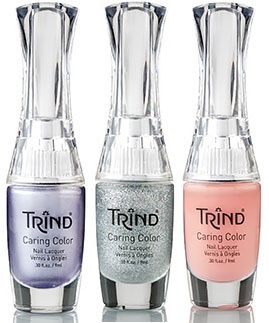 Trind Caring Color Nail Lacquer Summer Shades - $13 - offers fashionable shades for fabulous summer nails with colours that have specially been developed to maintain the health and vitality of nails. The Trind Caring Color Line works even better when used with Trind's treatment products - I particularly love the Trind Keratin Nail Restorer - $22.50 - a nail strengthening product for weakened or damaged nails that you use for four to six weeks to get nails back to good health - :the combination has an incredible effect on the nails. The high-tech innovative formulation in Caring Colors contains active ingredients that strengthen and improve the overall condition of the nail, optimize adhesion of polish to prolong the life of your manicure, and creates a beautiful sheen. The line includes a base coat and top coat with the active ingredients to maintain and sustain the health and appearance of beautifully polished nails! And right now is the perfect opportunity to try Trind Caring Colours for the first time or stock up your already extensive lacquer wardrobe with their 2 for 1 deal - buy any Trind Caring Color and receive the second one free. Use the code - CARING2FOR1 online at www.trind.ca and you can find more info on the line along with pretty pictures at https://www.facebook.com/trindca.